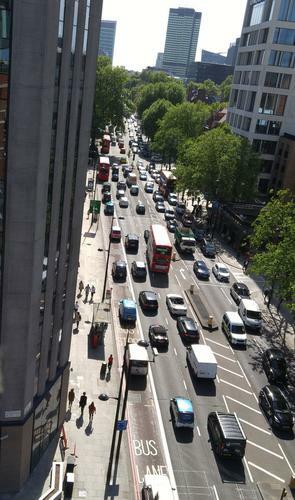 Traffic on Euston Road in London. Traffic jams may become even more of an aggravation than they are today as mobile networks struggle to handle a rapidly increasing number of connected cars. In a future where money from voice and messaging will no longer be the cash cows they once were, connected cars, homes, cities and industries represent some of the biggest revenue opportunities for mobile operators. But with great opportunities come great challenges. Traffic growth from M2M (machine to machine) connections, particularly from cars, will cause headaches for mobile operators, according to Machina Research. There are several reasons for concern. The sheer number of car connections is part of it -- they are expected to surpass 500 million in 2019 and 1 billion in 2023, when they will account for more than half of all M2M connections over cellular networks. Cars will use lots of data, thanks to connected entertainment and navigation systems, according to Matt Hatton, the director of Machina Research. A traffic jam could end up causing a corresponding network blockage, with kids not being able to watch online movies and navigation systems failing to display a good alternative route. And thanks to the vagaries of car traffic in the physical world, it will be difficult to predict when and where big jumps of network traffic will occur. Other applications are also putting new demands on mobile networks. For example, agricultural applications are increasing the need for top-notch rural coverage and healthcare technology demands reliable connections in life-or-death situations. There is an awareness in the telecom industry that mobile networks have to change to keep up. Network vendors are shrinking the size of base stations and making them easier to install, paving the way to better network coverage. A new, more M2M-friendly version of LTE is also being developed, and lower latency and improved reliability are key 5G design goals. Machina offered a word of warning for mobile operators that don't take the challenges posed by M2M technology seriously. They will suffer knock-on effects, either in terms of an inability to take advantage of new revenue opportunities, or the wrath of users who are suffering because of overloaded networks.